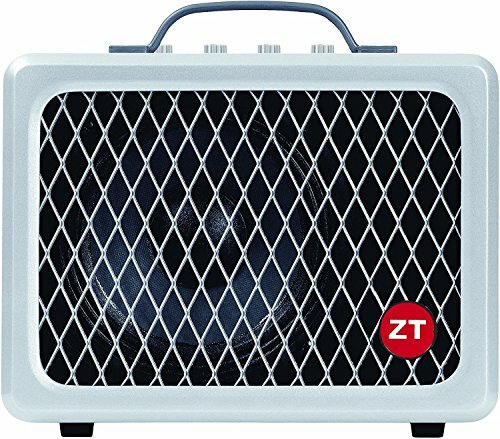 The ZT Amplifiers Lunchbox Combo Amplifier is an ultra-compact amp loud enough to gig with that weighs less than 10 pounds. Packing 200 watts of power, it pumps a ton of power through its 6.5" internal speaker, and can simultaneously drive an external cabinet. On its own the Lunchbox can overpower your drummer with ease. Unlike any other amp close to its size, it has the muscle to handle any effects you throw in front of it, and the warmth and depth to sound great with single-coil pickups as well as humbuckers. Add a Lunchbox Cab extension speaker (sold separately) or go bigger with a 2x12 or 4x12 cabinet for even more output, enhanced bottom end, or tonal variation. The Lunchbox amp's clean tonal palette is versatile enough for rock, blues, jazz, and country players alike. This amp is adored by pedal freaks, and takes a boost/overdrive like a champ. It has all the give and responsiveness of a classic tube amp without the size, weight, and maintenance. The Lunchbox is used in studio and on stage by high-level pros such as Billy Gibbons (ZZ Top), Nels Cline & Jeff Tweedy (Wilco), Andy Summers (The Police), and Lee Ranaldo (Sonic Youth), and has been a best friend to musicians worldwide who love its versatility and portability. Add the Lunchbox to your collection and you'll wonder how you ever lived without it. If you have any questions about this product by ZT Amplifiers, contact us by completing and submitting the form below. If you are looking for a specif part number, please include it with your message.